I have a confession! This year, I read......for the first time.......Pride and Prejudice. Yes, I know, I should be ashamed, but I'm not! I grew up reading Louisa May Alcott and Lucy Maud Montgomery and when I discovered Regency Romance, Historical Fiction and Harlequin Romance I couldn't put those types of books down. Classics ended up on my collectors shelf not in my hands unless it was an author like Alcott or Montgomery. I'm not sure I would have appreciated Austen as much at that time of my life either. Kelly, you should be ashamed of yourself! I've watched the mini-series with Colin Firth, you probably got that from Sunday's Shenanigan's Post, and right now I would give anything to watch it again after reading all that I have delved into this past year in regards to P&P (Christmas Wish hint for the fam). You may ask, how did this all transpire? Well, it started with a Spoof Novel......Pride and Prejudice and Zombies by Seth Grahame-Smith. 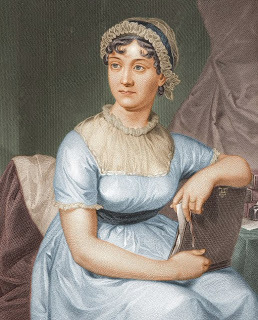 I believe die hard Jane Austen fans are now gnashing their teeth and planning a search mission to turn me into a zombie but seriously the man has to love Austen and Pride and Prejudice! He didn't rewrite P&P, he added zombies. It's being done in the name of literature to all kinds of classics and historical figures. Authors are making money, fans are loving it and I'm not going to lie, I'm a fan! I don't see it as besmirching the memory of Austen or trashing a great classic, I see it as adding some fun into a world - that lets face it - isn't very fun all the time. It's also a great way to introduce classics to kids in a world where they are not easily entertained and reading is for nerds not cool kids. Yep, downloaded and read that too. Now, this is a continuation and therefore Jane Austen gave nothing except the characters and setting to this novel while these 2 authors followed Seth's example and doused England in a barrage of Zombie gore! This novel also had me laughing. Any self respecting bibliophile, I'm sure, would feel the same way I did at this point and immediately downloaded the 3rd and final in the series written solely by Steven Hockensmith, Pride and Prejudice and Zombies: Dreadfully Ever After. Mr. Darcy gets bitten.....and the adventure begins. Though not as humorous as the first two novels in the series this was still entertaining and the ending was excellent (funnier towards the end as well). It was more on the edge of your seat reading and where the heck is this author going to take us next. I will say that Catherine de Borough plays an excellent character in these novels and her comeuppance for all the torture she puts everyone through is wickedly hysterical (self deserved in relation to not only these 3 novels but the original P&P as well). As I finished the final in this series I realized I had never read Austen's P&P. Did these authors follow the story and the characters that I had grown to love? Had they inadvertently changed the image too drastically of Elizabeth and Darcy and their love story? I had to find out and I couldn't remember the mini-series very well. So I checked my Kindle and sure enough I had downloaded it. I fell in love with Elizabeth and Mr. Darcy and many other characters while reading Austen's novel. So much so that I started sifting through my collection of Kindle novels looking for continuations that I had spotted on Goodreads and Amazon. I didn't even realize how many I had downloaded over the past year because they were free for a short time and had sounded interesting. Anna Elliot's, Georgian Darcy's Diary continuations are my absolute favorite. They are written in diary form because Elliot knew she couldn't possibly continue with Austen's prose. I read these in a matter of days, unable to put them down and eating up the words as if they were delectable chocolates. I love that this author was like me...she didn't get enough and felt Georgiana's part in P&P was too small, she deserved happiness, she deserved a voice!!! I love the glimpses of Darcy & Elizabeth and the obvious fact that she in part emboldens Georgiana, who is so terribly shy, yet has it in her as well. Their sisterly bond strengthens her and gives her an independence I think Austen would have appreciated. Anna Elliot is due to release another diary which I'm looking forward to, Kitty's Diary (a publish date hasn't been released that I know of). This is happily ever after Charlotte deserves. Other continuation novels I've read made her insipid and unlikeable and did not follow along with the intended character traits Austen obviously characterized for Charlotte. They make her misery apparent and add to it. Aminadra saw Charlotte a lot like I do. Any great friend of Elizabeth's must have been intelligent and witty with patience and a quiet but loving and very humorous manner. There was only one part of this story that I didn't care for and that was the part Colonel Fitzwilliam played and if you read these 3 novels you will see why I pretended he was a completely different character and not my Colonel Fitzwilliam from Georgiana Darcy's Diaries. I can't completely leave off without mentioning Mr. Collins and without spoiling the story Aminadra does justice to his character and that of Charlotte's choices. *His Good Opinion: A Mr. Darcy Novel by Nancy Kelley, which was Jane Austen's P&P just switched around a bit to add Mr. Darcy's perspective. I read this directly after reading P&P so I felt as though I was reading the exact same book with snippets I had already had running through my brain of Mr. Darcy. *Christmas Present by Amanda Grange, a very cute short novella that I really enjoyed set at Christmas a year or so after Mr. Darcy and Elizabeth have married! Amanda Grange does have a few continuations and even Mr. Darcy, Vampyre that I wouldn't mind reading but that will probably have to wait until next year. I do believe that covers my Pride and Prejudice obsession for this year. If you have come across any continuations that you have fallen in love with let me know and I will check them out! I even have 2 more novels on my kindle that I haven't had the heart to read yet -. One Thread Pulled: The Dance with Mr. Darcy by Diana J. Oaks and Mr. Darcy's Letter - another variation by Abigail Reynolds. ﻿Though I may end up reading One Thread Pulled after my experience with Reynolds other variation I doubt very much that I will make the mistake of reading Mr. Darcy's Letter. It was an enjoyable year filled with Elizabeth and Mr. Darcy. Next year I may tackle another Austen heroine though I haven't yet decided which one.